County Kerry (from the Irish, Contae Chiarraí) is something of an oddity. Having the unique geographical distinction of bordering on only two other counties, and positioned towards the Atlantic Ocean, it receives warm, flowing winds from the Gulf Stream, which usually tails the eastern coast of the United States. As a result, a variety of subtropical plants are known to flourish here. 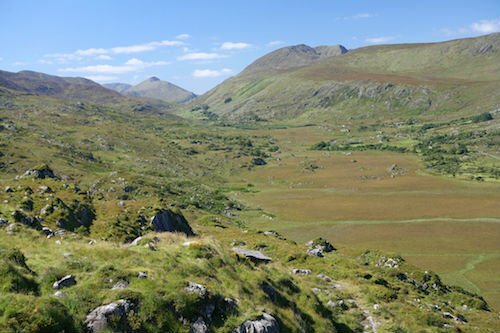 The surrounding mountainous area means that Kerry also receives the highest annual rainfall in Ireland. Two of the three highest mountains in Ireland, Carrauntoohil and Mount Brandon, loom over Tralee Bay (to the north) and Dingle Bay (to the south) as part of the Slieve Mish mountain range. The mysterious, 13th century Parkavonear Castle (the history of the castle has gone unrecorded and forgotten), also known as The Bishop’s Chair, can be found in Killarney. The minuscule Innisfallen Island, one of three in Lough Leane, contains within its 21 acres the ruins of a 7th century monastery, a 12th century Augustinian priory and a 12th century Romanesque church (accessible by boat from Ross Castle). Torc Waterfall and Mountain are found along the Muckross Lake Loop, which travels around Muckross Lake. The Troubles, which occurred primarily in Northern Ireland, traces its significant history to its origins in Kerry. The Anglo-Irish Treaty, which gave 26 of the counties of Ireland back to the Irish with the stipulation that Northern Ireland would belong to the United Kingdom, was met with resistance in Kerry and resulted in a sub- internal conflict between the IRA and the Irish Army, who had formerly allied against the RIC and the British Army. 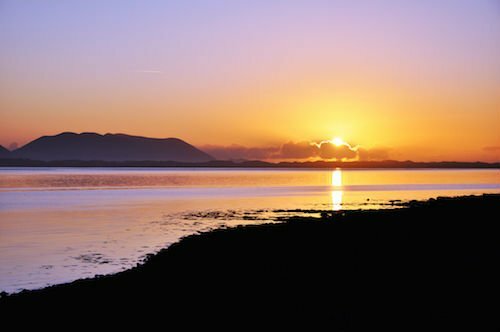 Not unlike County Mayo, however, Kerry is sufficiently isolated from the rest of Ireland to have successfully withstood the onslaught of foreign invaders and has managed to uphold many cultural traditions. The Gaeltacht region is home to thousands of native Irish language speakers and Irish traditional music and dance feature heavily in pubs and festivals all over the county. 14. 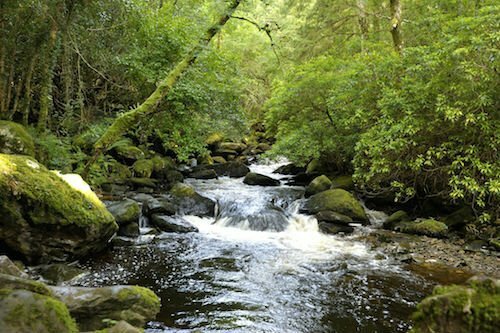 Torc Waterfall and Mountain are found along the Muckross Lake Loop, which travels around Muckross Lake.